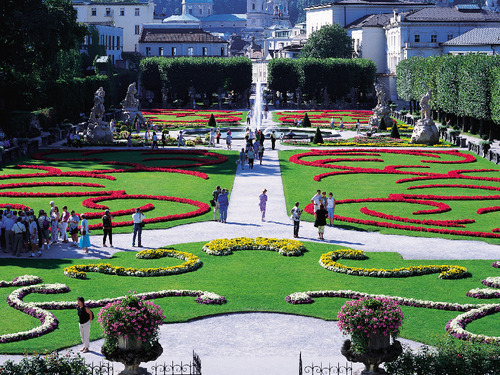 The Mirabell Gardens are probably Salzburg’s most romantic place and the ideal meeting point for lovers. Among the colourful flowerbeds you can step into another world and admire the charming Dwarf Garden and the majestic Pegasus fountain. These fantastic gardens have enchanted visitors for many years, since they were founded in the 17th century and have still lost nothing of their charm. The beautiful gardens belong to the Mirabell Palace, which was built by Prince Archbishop Wolf Dietrich as a token of his love for Salome Alt. Today, the Palace not only houses the city council and several assembly rooms, but also one of the world’s most romantic wedding halls. If you want to discover the different sights of Salzburg, you should choose a suitable hotel. The Hotel zur Post offers modern and comfortable rooms and excellent service. Thanks to its central location, all major sights of the city are only a short walk or a few minutes‘ bus ride away. Take a look at our holiday packages and special offers and book now.